This delicious traditional stew is very popular at Turkish homes, and as well as in our traditional restaurants, lokantas. It is lovely when cooked with Pastirma, Turkish Pastrami, dried cured beef with a special spicy coating too. This is the Turkish version of the French Cassoulet, the sausage, meat and white beans stew, though much lighter and easier to prepare. You can replace the sausage here with any other sausage (chorizo works well) or meat of your choice. For a vegetarian option, simply omit the meat. You can cook this stew ahead of time, even a day in advance. It freezes very well too. Sauté the onion with the olive oil until soft. Add the sausages and sauté for another minute or so. Stir in the chopped tomatoes, (and the red pepper paste if using) and mix well. Then add the white beans and water, mixing gently so that the beans won’t break. Season with salt, black pepper and red pepper flakes. 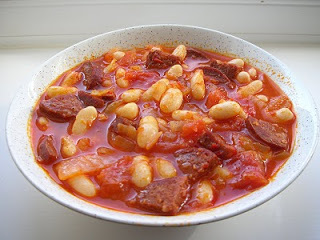 Cover and cook in medium heat for about 50 minutes, or until the beans are cooked (cooking time should be about 20 minutes if precooked beans in can are used). Serve hot with plain rice by the side. 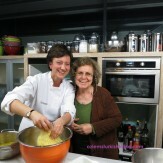 My good friend Kate came over and we made Kisir today; it was lovely to cook with a friend and share the food. Kate is such a foodie and it is amazing to see how the food connects people no matter where we come from, a universal language. We talked about how important it is for us to be able to share and have an access to the recipes from our mothers, grandmothers, and be able to pass on to friends, family and to the next generation. 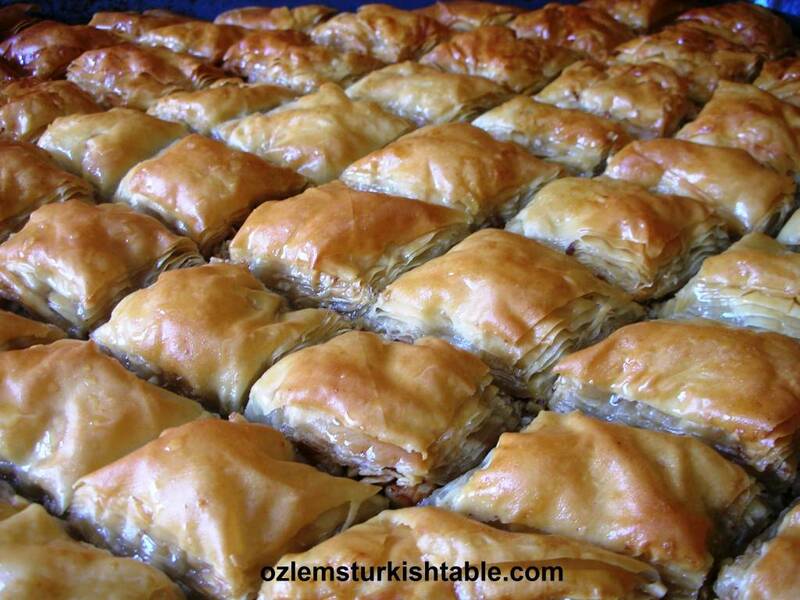 More than being recipes, they really reflect our heritage, culture, traditions and keep the memories alive. 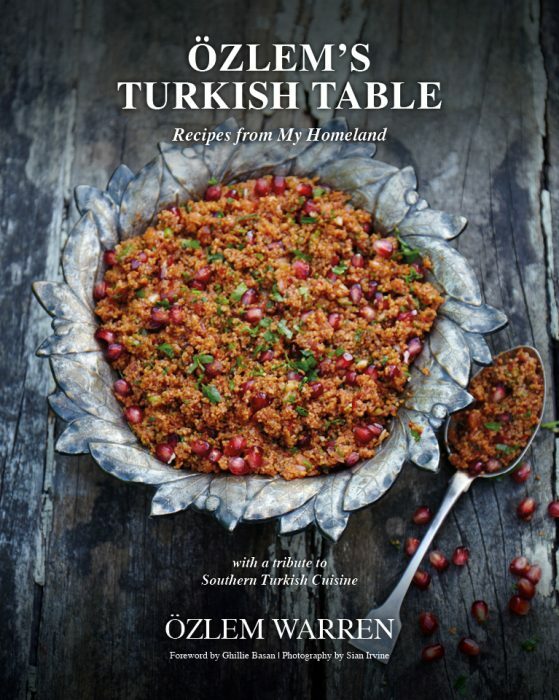 I am delighted to include this wonderful Spicy Bulgur Wheat Salad, Kisir and 90 more healthy, authentic Turkish recipes at my cookery book, Ozlem’s Turkish Table, Recipes from My Homeland. I love this salad so much that it is at the cover of my cookery book! 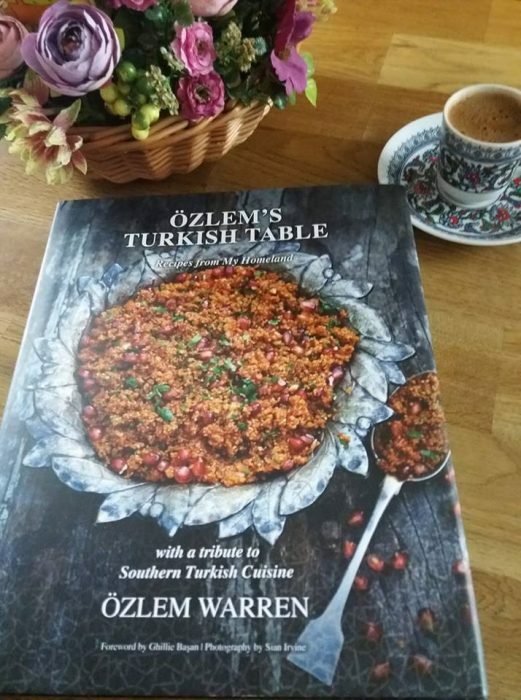 If you would like to get a Signed copy of Ozlem’s Turkish Table, you can order at this link; it can make a wonderful gift to yourself or to a food lover. So here comes kisir. 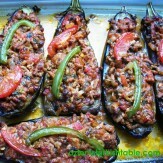 Kisir is a specialty in the southeast of Turkey, from where the country’s spicier dishes hail. It is offered as a welcome to the guests in the homes of Antakya, where my roots are from, and in Gaziantep. 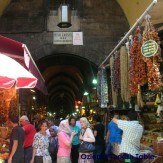 Kisir is generally made with nar eksisi (sour pomegranate syrup) instead of lemon juice – though it is common to use lemon juice for Kisir at northwest Turkey. It can be rolled into balls and served nestling in crunchy lettuce leaves. This dish is perfect for buffets or as part of a barbecue spread. It really is a “bowl of health and goodness” with fresh vegetables, bulgur – packed with fiber and pomegranate sauce full of antioxidants. This wonderful, refreshing can be prepared a couple of days in advance and can be stored in the fridge for 4-5 days. As a matter of fact, it tastes even better a day or two later it’s made! I hope you can get to try the recipe. If you can’t find pomegranate molasses, a good balsamic vinegar and lemon juice also works well in this bulgur wheat salad. 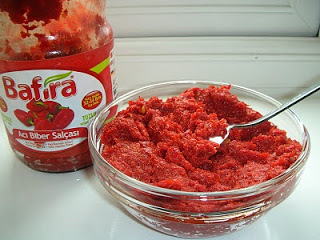 Turkish hot pepper paste, biber salcasi is used widely in this salad in Southern Turkish cooking; you can always make your own red pepper paste, here is my recipe. Mix the bulgur wheat, salt, ground black pepper, red pepper flakes (or paprika or chili flakes), tomato paste, red pepper paste and the chopped onion and knead thoroughly – this will help all the flavors marry and the onion to soften-. Pour the hot water over this mixture and stir, then leave to stand for about 15 minutes. It should absorb all the water by the end of this period. 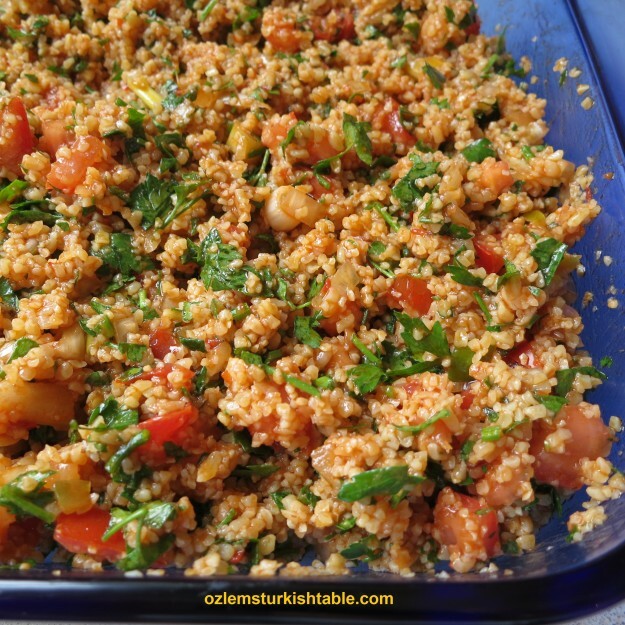 The bulgur should be of a dry consistency. Add the lemon juice and the pomegranate syrup together with the extra virgin olive oil and knead well again. Stir in the remaining ingredients and combine thoroughly. Serve as a salad in a bowl garnished with lettuce leaves. Alternatively, take spoonfuls of the mixture and with wet hands roll into balls the size of walnuts. Refrigerate until required. Note: Bulgur wheat unlike cracked wheat, is a grain made from the cooked wheat berries which have the bran removed, and are then dried and pounded. There are two varieties generally available, fine and coarse. 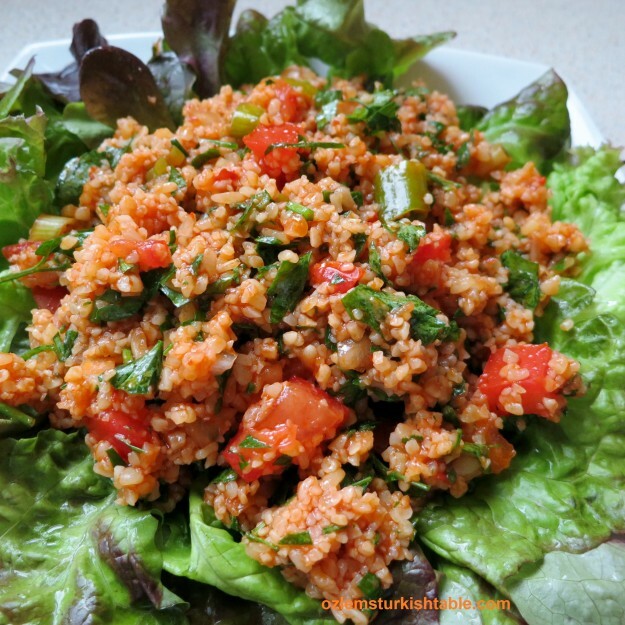 If you can get the fine bulgur wheat, use 1/2 cup water for 1 cup fine bulgur wheat.